Miu Miu is one of the brightest stars in the Prada portfolio. 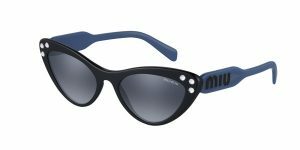 A leading name in the domain of luxury eyewear, Miu Miu stands above the rest for its daringness to explore new ideas and bring out an impressive range of high fashion products across categories. 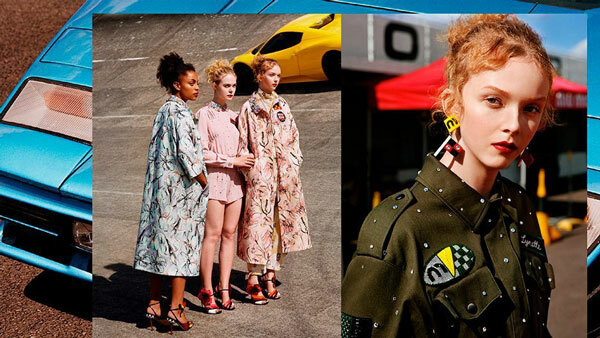 Intentionally, placed far from the traditional creative methods of the Prada people, Miu Miu unleashed a breath of fresh air with its creative offerings for the high-end fashion lovers. From the very beginning, Miu Miu has portrayed itself as a feminine fashion brand. Its colours are bold and so are its designs. In fact, this boldness is one trait that sets apart Miu Miu’s offerings from its parent Prada. Miu Miu came into existence in 1993, as a diffused version of Prada. Muccia Prada, the creative director of Prada and the descendant of the Italian fashion house was fondly known as Miu. Little did the ace designer know that his nickname would end up being one of the most loved fashion labels. From its inception, Miu Miu raised expectations with its avant-garde variety. Within a year of its launch, Muccia Prada received the Council of Fashion Designers of America Best International Designer Award for her Miu Miu collections. The coveted awards were the perfect platform that helped establish Miu Miu several levels above its competition. While Miu Miu has always presented itself as a very feminine brand, they did foray into the men’s accessories segment as well. However, the stint with men’s accessories did not last long. In 2008, Miu Miu shut down its men’s accessories segment and decided to channelize all its energies to the women’s segment. In 2008 itself, Miu Miu went on to open a concept store in Taipei and a boutique on Rodeo Drive in Los Angeles. The concept store housed Miu Miu’s first shoe collection that included ballerina flats, heeled leather boots, and masculine loafers make up. This was soon followed by an accessory line that included retro sunglasses. 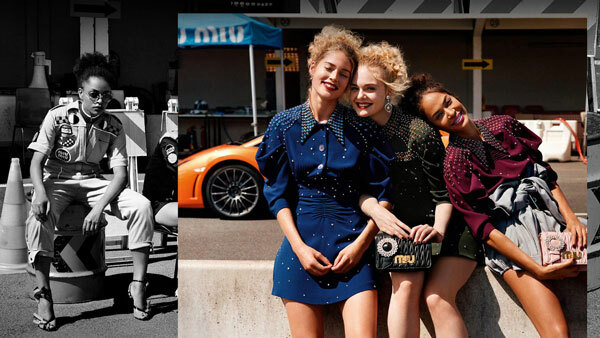 Chloë Sevigny, Lou Doillon, Laetitia Casta, Vanessa Paradis, and even young Hailee Steinfeld all contributed to Miu Miu’s seasonal campaigns, paying tribute to the modern young woman. To further strengthen the brand’s position in the female accessories segment, Miu Miu also launched the Women’s Tales series. This campaign comprised short films, all of which were made by critically acclaimed female directors. Miu Miu’s foray into perfumes was later than expected. After tasting success in various segments of the women’s line, the brand finally forayed into the domain of perfumery as well. The first fragrance came out in 2015. Embodying Miu Miu’s bold spirit and love for feminity, the perfume was an instant favourite among the crème de la crème of the society. Miu Miu’s first fragrance came out at a time when perfumery was used to the idea of sugary and sweet notes. Many of the perfume makers were hesitant to play with the bold notes fearing a backlash from customers. However, Miu Miu took the bold step to stand out. And the effort did pay off really well. Miu Miu’s first fragrance was a breath of fresh air, breaking the monotony that may have been holding back the industry. Perfumer Daniela Andrier created this fragrance. It took them over 1200 tries to get the fragrance right. Alasdair McLellan returns to visualize the latest Miu Miu collection. The spartan yet wistful nature of the environment is explored through the repurposing of decorative floral patterning and plaid layered onto classic work-wear silhouettes. For the latest Miu Miu campaign, the Southwestern desert in North America has been chosen as the location. The new collection is focused on the modern woman renowned for nurturing experimental thinking, women who quite often use their social platforms to promote progressive attitudes congregate in and around historically radical architecture. The new Spring/Summer 2018 Miu Miu Eyewear collection oscillates between naive accents and iridescent subversion, unveiling the most unconventional spirit of contemporary femininity. The glasses experiment with new forms of stylistic expression, blending modern elegance with a nonconformist, at times carefree, attitude. 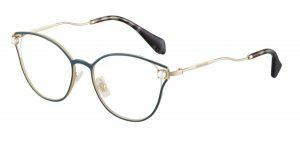 Eyewear designs majorly consist of feminine oversized silhouettes embellished with precious detailing, sophisticated contrasts, and fine interplays of shapes and colours. Geometric minimalism meets the lightness of sparkling details in the new Miu Miu Société fashion show collection, an inspired blend between the frames’ sober sophistication and skilfully crafted lenses. The glasses of the new Miu Miu Manière collection convey a sense of ironic femininity, enhanced by precious pearl and crystal inserts, perfectly contrasting with the lighthearted attitude of the large, playful shapes. Drawing inspiration from the season’s accessories, the new Miu Miu Logo collection expresses alternative elegance, an innovative mix of retro silhouettes and ‘pop’ details. 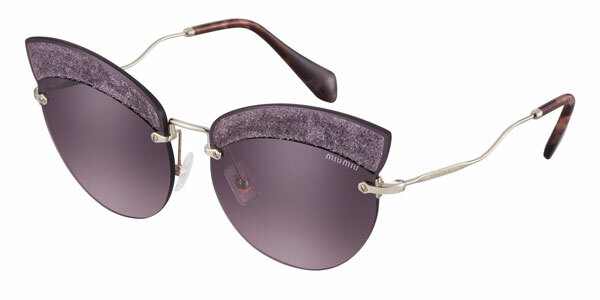 These sunglasses from the Miu Miu Logo special collection are all about retro accents and ‘pop’ details. Drawing inspiration from the season’s accessories, the model flaunts a cat-eye acetate front enriched with crystals on the upper corners, colour matched with the lenses; the acetate temples feature bold volumes and bright hues and bear the noticeable Miu Miu logo. A new optical take on the Miu Miu Manière special sunglass model. The frame, now presented with toned down dimensions, features a squared, slightly cat-eye front exalted by a sleek metal profile and adorned with a single pearl nestled on each upper corner. 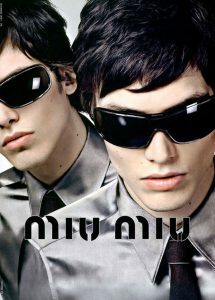 Sinuous, slim metal temples bearing Miu Miu’s finely engraved logo. 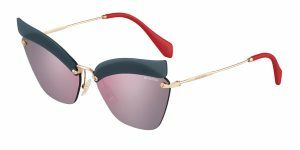 The Miu Miu Folie collection is now reinterpreted, giving life to a new metal sunglass design with a sophisticated, feminine allure. Large, exquisitely shaped exposed lenses are highlighted by distinctive brow bars – the signature of the collection – embellished with a cascade of multifaceted crystals of different sizes.